What shall we do, what shall we do with all this useless beauty?" The rather diverse Elvis Costello retrospective A Case For Song was recorded for BBC television in June of 1996, and until now had only been available on VHS. This new Rhino release bests the tape version by not only providing a pair of solid audio mixes, but by including six tracks not found on the original VHS�Temptation, I Almost Had A Weakness, Almost Blue, Shipbuilding, Man Out Of Time, It's Time. All of this give is not without a little take, however, because strangely absent here are versions of hits like Watching The Detectives and Accidents Will Happen, which apparently are going to forever remain VHS-only performances. Ditto for a missing intro by Squeeze's Jools Holland, which is gone from the DVD release, though his name is still included in the credits. Those missing bits shouldn't be a major sticking point, because this intimate 101-minute concert has Costello boldly painting himself in five very different artistic combinations, with a set list that has him performing solo, with The Attractions, with just The Attraction's Steve Nieve, with The Brodsky Quartet and then paired with both the Brodsky's and the White City Septet. It's a sprawling block of varied musical stylings� that allows Costello to put a new spin on some of his more familiar work�the beautifully stripped down acoustic version of Veronica, for example�while reinventing the twangy Nashville country of Almost Blue as a mini-orchestral standard fit for a crooner. The inclusion of a moving rendition of Costello's Falklands-inspired Shipbuilding�complete with a swanky new arrangement by producer Clive Langer�plays well alongside a somewhat more robust take on Man Out Of Time, where a forlorn refrain like "to murder my love is a crime" never fails to deliver the appropriate sense of melancholy. In what is probably the most unexpected moment here is a string quartet cover of The Beach Boys God Only Knows, in which Costello goes for baroque by transforming the song from a glossy summery radio ballad into a stirring vocal exercise. 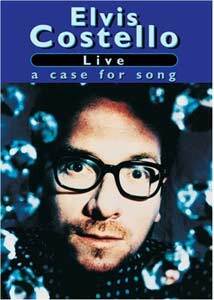 The performances here are all first rate, but it is Costello's talent as a clever, intelligent songwriter that really takes centerstage here, and with the exception of the somewhat out of place Pump It Up, the remainder of the set list showcases his ability to layer richly complex lyrics. Throughout his career he has routinely packed his songs with an abundance of angry eloquence and imagery, often too smartly caustic and open for what passes as everyday pop music. This could have easily been a tired "best of" set, but what we're given here is a deeper look at Costello's vast catalog. Image Transfer Review: Presented in its original 1.33:1 fullframe, the clean transfer is dominated by varying shades of blues, balanced by deep black. Some occasional minor bloom from stage lighting, but overall the level of detail on facial closeups is razor sharp, though some of the long shots from the back of the house just don't have the same degree of sharpness. Audio Transfer Review: Two very strong audio choices here, either Dolby Digital 5.1 surround or PCM stereo. Both reveal the more subtle nuances of the instrumentation cleanly (the Brodsky Quartet pieces especially), with Costello's vocals resonant and crisp throughout. Bottom end is never particularly deep�nor does the performance here really demand it�, but the rear channels are used with audience applause to create a pleasing, natural live soundfield. Extras Review: No extras at all. The disc, however, is cut into 21 chapters, with the only non-song-releated stop being the end credits. A curiously strong set list is enhanced by a multitude of backing musician combinations. The man rarely disappoints, and here EC is fully on his game as he proves his worth as one of the finest songwriters of the last 30 years. One of my favorites for 2007, this one comes highly recommended.